We are proud to offer a Veterinary Dermatology & Allergy Department at Mount Laurel Animal Hospital. 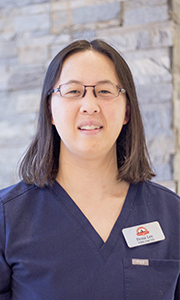 Our dermatology team is led by Dr. Fiona Lee, an experienced and compassionate board certified specialist in veterinary dermatology and allergy. Specialty medicine allows focused treatment of a challenging problem with extended training and exclusive equipment. To learn more about board certified veterinary dermatologists, visit the American College of Veterinary Dermatology. Allergies and secondary infections, in particular, are common reasons for itch and skin lesions. Since every pet responds differently to various treatments and medications, our veterinary dermatologist works closely with pet parents and primary veterinarians to create a personalized treatment plan for their companions and to improve quality-of-life. All animal species are welcome, including small animals (dogs and cats) and exotic pet species. CLICK HERE to contact our Dermatology Team.